Versatile trench cover suitable for pedestrians and 2 tonne vehicles over a 700mm trench. The rubber Flexi-Edges around the outside of the LowPro grip the surface to reduce unwanted movement. The anti-slide Flexi-Edges can be replaced to extend the life of your LowPro. 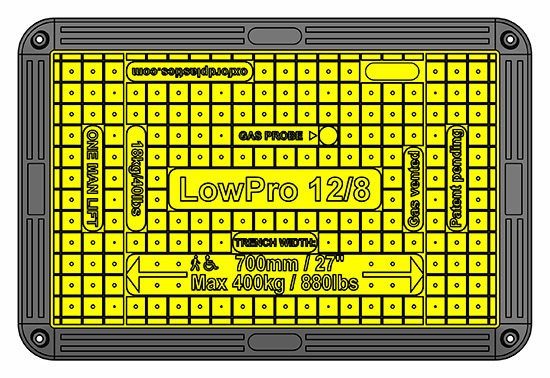 The patented Flexi-Edges of the composite trench cover LowPro range do not need to be bolted down. This greatly reduces trip hazards for pedestrians and reduces installation time. This glass reinforced composite trench cover has ribbed framework for added strength.